In going through my PPL (Past Post Library), I noticed I’ve never once written on Valentine’s Day about Valentine’s Day. 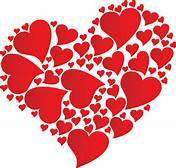 I do have a husband that I’ve Valentined in my heart for over 35 years. I have two great sons that also deserve my Valentine, along with a sweet daughter-in-law, her great parents, two sets of great best friends, and my two Valentine grandkids. But somewhere along the line I never connected my love for them with Valentine’s Day. I know it’s a holiday created by Hallmark, another way to cash in on human emotions. Nothing wrong with that. Candy, flowers, heart-shaped cakes, all fall into the going-the-extra-mile for your sweetie. There are online articles about 10 Valentine’s Day Flowers and their Meanings, Celebrating Valentine’s Day with a Box of Chocolates, and other romantic inklings to set the mood. The love of my life has never really given me anything for Valentine’s Day. And that’s been over 35 years. Am I insulted? No, not really. I knew 35+ years ago that he was not the roses and chocolates type. And that was alright. It still is. For most of my life there was so much more we could have done with the $50 he would spend on flowers or wine. My Valentine’s Day gift would be an extra pizza in the grocery cart or rent a movie from Redbox. Times have changed. We are in a better financial place than we were 10, 20, even 30 years ago. Our Valentine’s Day money went to taking my grandson to see the Lego Batman Movie. That was fun — that was love. Three girls at work today had flowers delivered to them. Does that bother me? …he gives me money to go out and buy my own flowers. I guess that’s Valentine’s enough for me. My husband had flowers sent to work one year. I told him don’t do it again. $75 for 12 flowers. This year he asked me if I wanted flowers and I told him to get me some daises this weekend. Being at home with him on Valentine’s day is enough for me. I hear you with that, my friend. Fresh flowers are beautiful but you can take a family of 5 out for dinner for that! We haven’t celebrated Valentines in a while — maybe a heart-shaped cookie or something. But I think Valentines Day in it’s true flirtatious form is for younger people anyway.